Short Put Ladder is exactly opposite of Short Call Ladder. In the Short Put Ladder Put options are traded instead of the Call options. Note: This is the last series on the Ladder trades. A lot of traders whom I have talked to trade the ladder trade without knowing they are actually trading ladders. Most of them sell more and buy less options which means they are trading the Long Ladder unknowingly. Unfortunately most of them are speculating to their comfort and obviously losing money. It always helps to know what you are trading and why? So if you are one of those who differentiate between the number of lots for buying and selling depending on your view, you are likely to do the same mistake again and again. Because every time you trade you will choose strike prices according to your convenience and not the correct strike for maximizing profits and minimizing losses. 4. Short Put Ladder – you are currently reading this. The view: In a Short Call Ladder a trader was bullish, since they are opposite trades the view should be also opposite. In Short Put Ladder the trader is bearish. However in both the trades the trader’s view on volatility should be bullish. 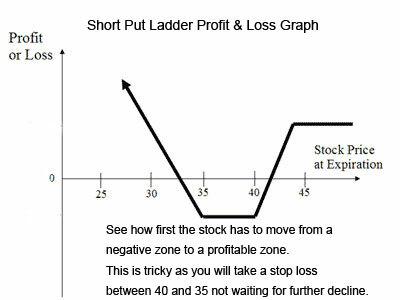 So when you are bearish on a stock or index and bullish on volatility you can trade a Short Put Ladder. You have to be bullish on volatility because you are buying more options than selling. Volatility helps the buyers. 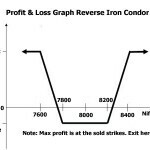 Note: In the above image the trader has got a credit while trading the short put ladder. This may happen rarely, but mostly you will have to pay a debit to trade this. If you get a credit this is a slightly better trade as if all the options expire worthless, you can keep the cash you got while putting this trade. But we don’t trade this to get a credit – we trade this because our view is bearish. However for bearish views there are better trades which I will discuss later. In the example below you will see that I had to pay money to trade this. As usual let me get real prices from the trading floor. All options expiring on 29-Jan-2015 (30 days from today) and rounded off. Assuming 100 shares (4 lots of Nifty) were traded in each option. So the trader had to pay Rs. 2600 to trade this Short Put Ladder. Note that this is not his max loss, we will soon see what the max loss is. All options expire worthless. The trader loses the initial investment of Rs. 2600. Note that above 8300 the results will be same. Loss in percentage of investment: For this trade almost Rs. 60,000 will be blocked. (For real figures please check your broker’s platform). However it should be somewhere near 60,000. Loss in percentage: (-12600/60000) * 100 = -21%. This is the max loss in this trade. Are you comfortable with this kind of max loss? At least I am not. I would have taken a stop loss long back. Very Important Note: Therefore any trades with such a huge max loss must be managed before things go out of hand. I have told this many times and will tell again that hoping something good will happen to your trades in future is NOT the right way to trade. It has more to do with your ego or fear than the stock markets. You must take your stop loss when you are not comfortable owning a trade. Now we will see some profits. For every 100 points drop the trader makes a profit of +10,000. Real trading is quite different. Look at the graph above. See that the stock has to travel from the negative zone to positive zone to make some profits. In real world your patience will run out and you will take a stop loss much earlier. Unfortunately what happens after that is of no use to you, as you will have already taken a stop loss when the stock was in the negative region. It of course cannot fly from 8248 to 7900, to just make a profit for you. Theretofore in my view this is not a good trade and should be avoided. If you have a strong feeling of a market fall you can always buy an ATM put and sell an OTM put (put debit spread) or sell a ATM call and buy OTM call for protection (credit spread). Fact is most of us cannot predict market direction therefore its very important that you learn conservative trades and be happy with the small returns it provides every month. The worst part in this trade is that you cannot manage your losses. The only way to do is to take a stop loss. Therefore these kinds of trades must be avoided. Short Put Ladder: Sell 1 ITM Put, Buy 1 ATM Put, Buy 1 OTM Put. If stock falls significantly the trader makes money. The stock travels from the negative zone to positive zone – in real world the trader loses patience and takes a stop loss – so this trade is best avoided. Have you ever tried the Short Put Ladder? If yes I would love to hear your experience in the comments section below.